Power reclining is just the beginning for the cozy features on this sofa. This piece also features a plush power headrest and a USB charging port, perfect for keeping you comfortable and your electronics fully charged as you binge watch your favorite show. Other details, such as the rolled arms and nailhead trim, add dignified traditional style to this sofa. 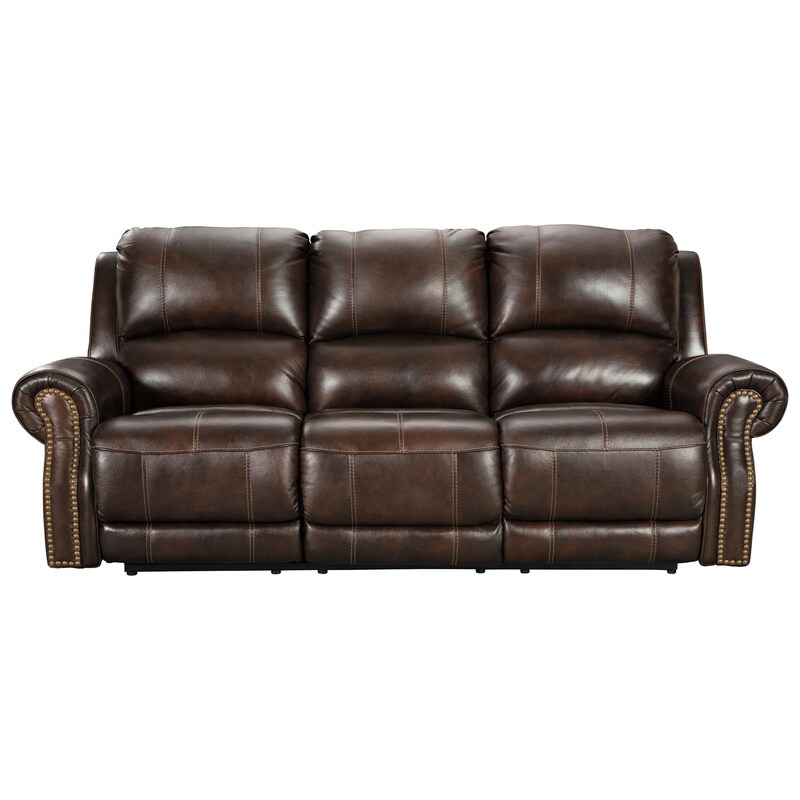 The Buncrana Traditional Power Reclining Sofa with USB Port and Nailhead Trim by Rooms Collection Three at Rooms Furniture in the Houston, Sugar Land, Katy, Missouri City, Texas area. Product availability may vary. Contact us for the most current availability on this product. Fabric Content All fabrics are pre-approved for wearability and durability against AHFA standards. Leather Match upholstery features 100% genuine top-grain leather in the seating areas with skillfully matched Polyurethane everywhere else. Tailoring Stripes and patterns are match cut. This style features Jumbo Stitching. Frame Construction Frame constructions have been rigorously tested to simulate the home and transportation environments for improved durability. Frame components are secured with combinations of glue, blocks, interlocking panels and staples. Complete your entertainment area with traditional style and modern practicality with this collection. Updated features such as power adjustable headrests and USB ports ensure these pieces are ready to keep your family comfortable for hours. Design features like the rolled arms, accent jumbo stitching, and nailhead trim detailing elevate the look of these pieces, making them timeless as well as functional. The Buncrana collection is a great option if you are looking for Traditional furniture in the Houston, Sugar Land, Katy, Missouri City, Texas area. Browse other items in the Buncrana collection from Rooms Furniture in the Houston, Sugar Land, Katy, Missouri City, Texas area.